If the signs were there last year, Australian country music festivals are set for huge growth in 2019. Their audiences are on a massive uptick, they are attaining great importance with, and support from, governments because of the tourism dollars they are spinning, and they are drawing a surge of relevance from younger fans through the growing Americana genre. Streaming and social media have made an important difference. Spotify ranks Australia as the third largest country music audience for its users. The importance is that as the younger audience find new country music via social media, they do so without being aware of its stereotyped image. Helping are the many country acts crossing over into pop radio. Barry Harley, general manager of Tamworth’s Toyota Country Music Festival tells TMN that “a significant upturn” in the number of younger fans, has been bringing down the average age of the festival patron from 55 to 49 last year. “A lot of the younger attendees are drawn through Americana,” suggests Harley. “They probably don’t even realise it’s country music, because they have this stereotyped image in their heads. The 10-day Tamworth event just wound up on the weekend drawing an aggregated 300,000 people. 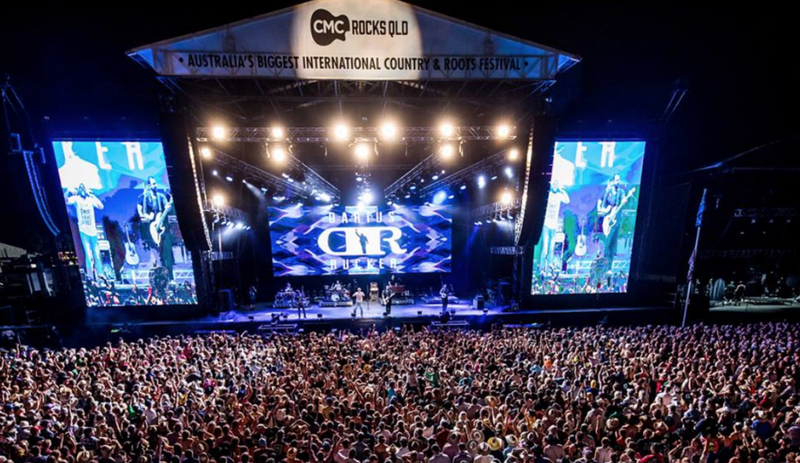 CMC Rocks Queensland has started selling-out the last two years, with the 2019 event, shifting 21,000 tickets in hours. What’s impressing its co-promoter Michael Chugg is that country music fans are so passionate. “Even with acts that aren’t that still well known, they go onstage and the crowd knows every song. There are no major country music radio or TV stations in the capital cities to break country acts. CMC Rocks have built up a huge database from the many tours that Chugg Entertainment and Rob Potts Entertainment Edge jointly staged in this country. Visiting US stars are knocked out by Australian audiences. “It’s amazing… how much energy this crowd has!” said Kelsea Ballerini. Luke Bryan added:” “The fans are crazy, they camp out for days, they just make the most of this experience. Queensland’s free Groundwater also showed tremendous growth, last year rebranding as part of a strategic change. It was set up by the Broadbeach Alliance, which started the country and Blues on Broadbeach, to stir up visitor numbers during the quieter winter months. This year it’s held July 26—28 on the Gold Coast beachfront, and already announced Lee Kernaghan, one the sector’s perennial drawcard, as a headliner. Its manager Mark Duckworth says, “Groundwater began here on the Gold Coast as the Broadbeach Country Music Festival six years ago. Duckworth’s take on the growing appeal of music festivals is that the growing artistry of domestic artists is also a major factor. “The audience for country music in Australia is wide and varied, there is definitely a new interest with younger crowds. Deni Muster general manager Vicky Lowry agrees: “A combination of the success of Australian country artists and the changing style of country music and the many new exciting artists attracting a new audience,” is her explanation for growth. Deni Muster has also been a triumph: staged in the NSW hamlet of Deniliquin primarily to raise money for local charities, it has grown from 5,000 up to 20,000 since 1999. It’s as known for its bull rides, whip-cracking and lawn mowing competitions as for its music. Lowry points out: “Our audience has changed from 20 years ago where the demographics was young singles. “These young singles are now married with families and still attending with their children. This year’s October 4—5 event has the extra drawcard of being turning 21, with US country superstar Tim McGraw already announced as the headliner. The Muster Adorer Tickets sold out in five minutes, while half the allocations for Early Bird disappeared in 24 hours. C2C (Country To Country), which has staged in the UK and Europe since 2013, lands here in spring 2019, with Tim McGraw Kelsea Ballerini and Texas band Midland. It is presented by TEG Live and AEG Presents, heading for Sydney Qudos Bank Arena on Saturday, September 28 and Brisbane Entertainment Centre on September Sunday 29. The other new kid on the block is Big Country which will take over the town of Berry on the South Coast of NSW on Saturday, May 11. Big Country also launches with a strong bill, including Travis Collins, Lee Kernaghan, The McClymonts, Caitlyn Shadbolt, The Sunny Cowgirls and The Wolfe Brothers. “Based off the initial reaction to our lineup announcement and how quickly the early ticketing releases disappeared it looks like Berry Showgrounds will be at capacity for Big Country. “With almost 10,000 respondents on the Facebook event already, we aren’t expecting much less than that in attendance. “Our sales data is showing an incredibly high percentage of purchases are coming from out of region, hovering at around 65-70%. He’s expecting Big Country to have a similar wide appeal that other such events have. “We are expecting to see an influx of people attending country music festivals from young adults and families right through to grandparents. “Artists that have lifted the profile of country music in recent times like stars Lee Kernaghan and Keith Urban have unlocked the door that has let new audiences emerge with more performers ready to satisfy the demand. Stewart already has future plans for his event, given the growing consumer support for the country music festival circuit. “There are so many different factors at play here,” he points out. “Self-discovery platforms like Spotify make it easier for listeners to connect with new artists that might not get so much airtime on commercial radio. “There are country music stars selling out arenas and blockbuster movies revolving around the genre filling cinema seats. “The general population is realising that this is music about a way of life that they identify with. This article and supporting images originally featured on The Music Network written by Christie Eliezer on Jan 29 2019, you can view it on their site here.